When ballroom dance instructor Lucy Wang misses her overseas-based daughter, she goes to YouTube. There she watches videos of 18-year-old Natasha Low, better known as Tasha, the leader and one-quarter of the up-and-coming K-pop girl group SKarf. 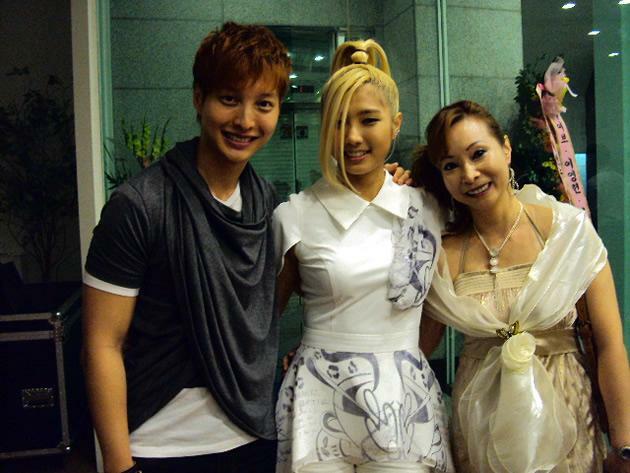 Tasha and 20-year-old Ferlyn Wong were picked out of 3,000 hopefuls in an audition in Singapore in 2010. They perform onstage alongside two other band members, Koreans "Jenny" Lee Joo Young, 16, and Jeong Sol, 21, who goes by the stage name "Sol". "I watch her videos almost every day actually," Wang shares with a shy smile on Tuesday at the sidelines of their maiden unveiling and fan signing session of the group at Bugis+. The SKarf girls are usually not contactable due to their work schedule and rules, so Wang has only the videos to see what her child is up to. But she remains very supportive of her daughter's career choice. Dancing runs through four generations of Tasha's family line, starting from her great-grandfather, and even her brother Nicholas does ballroom dancing as well. "She still is different from the rest of us, though I never even taught her (ballroom dancing) because she's always been more inclined toward hip-hop," she added. This was in part the reason why she also decided to trust her daughter when the latter decided to audition for the band. "She herself wanted to go through (all of it)... it's been more than a year now, and I still believe that she can do it, because she said she can and she will do her best — so I have no worries," she said. Wang, 46, had hopes of catching up with Tasha during the five days the Singaporean mother spent in Korea to catch the girls' debut, which led into their month-long promotional tour around the country, but they did not get to speak to each other at all. Even during the group's Bugis event earlier this week which saw 500 fans turn up, Wang did not get to meet her daughter apart from having the picture above taken with her, she told Yahoo! Singapore. "(Up till now,) I still haven't had the chance to speak to her... we just hugged (when she arrived) at the airport, that's all," she said. Indeed, the girls' schedule is packed to the brim — even when back in Singapore. In those time, Tasha and Ferlyn stay in a hotel with Jenny and Sol, and don't have the opportunity to go home with their families. When they're in Korea, it's even more of a challenge for their families to keep in touch with the girls' rigorous training schedules, including hours of dance practice and Korean lessons, with minders who confiscate their electronic devices until after midnight when their days end prevent them from having enough time to rest. It's for this reason that homemaker Rosy Ng, Ferlyn's mother, says they simply try to avoid disturbing her as far as possible. "We were still able to talk here and there during the first four or five months she was (in Korea), but after that everything is confiscated (during most of the day)," said the 49-year-old. "We try not to disturb her. Since she's there, the stage is hers... (and) since she's got so many people supporting her, she must do her best and perform her best to the audience!" Wong admits she was initially ambivalent about her daughter plunging head-first into the Korean pop business, given its risks and how few are eventually able to succeed despite the hefty investment of money, effort and time into training, preparation and grooming. The hardest part for her in particular, though, was the separation anxiety she experienced with the knowledge that Ferlyn would be based in Korea. "She's always been at home after school or her events, and she's considered quite an obedient girl," she said. "Now that she's not at home, the house is so quiet — it feels like something is missing." Any of Wong's doubts about Ferlyn's decision faded away when she watched SKarf's début in August, though. "I was very satisfied with how she turned out with the training. It's very tough, but she did it very well, and I'm very proud of her," she said. Ferlyn's brother Honsonn also makes the effort to send her daily motivational texts to keep her going when she is in Korea with the girls. "Whether she replies is another thing, but I do that every day before I sleep," he says. "Her replies aren't that regular, but it's a good sign because I know she's too busy!" In his messages, the 23-year-old says he would encourage her and her fellow band members to keep working hard, reminding her that SKarf's fans in Singapore are behind them and not to let them or their families down. "I would say 'Go for it. You're only 20; even if you're tired, just keep moving on. Go, and when you look back 10 years later you'll have no regrets," he adds. Honsonn said he had faith in his sister's potential from the start, and was one of the main people who convinced her to audition. "I've always known there was something in her — she's a very talented dancer, and she sings well too... so I told her 'I'm sure you can do it.' You have your passion, it's your dream... go for it, and if you fail, go for it again... luckily she made it through the first time though!" Despite not being the main event, he, too, has already experienced spillover effects from his sister's rising stardom — having been approached to sign photographs of himself and asked to pose in many photos with fans before as well. Yet, he uses even these opportunities to thank fans for supporting SKarf, and to encourage them to pursue their dreams. 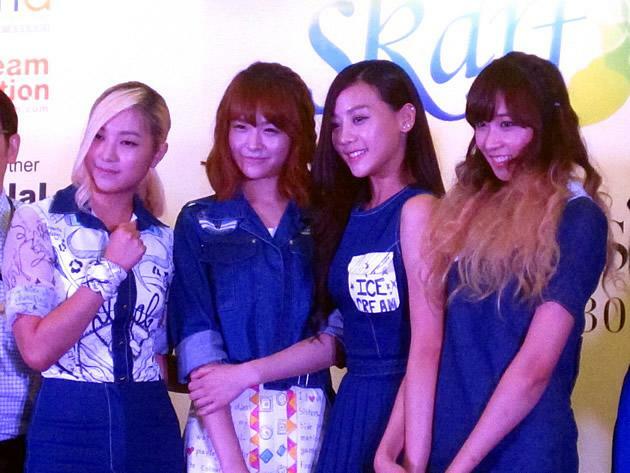 "I've told a lot of fans that SKarf isn't just a symbol of Singaporeans and Koreans collaborating," he said. "It's a symbol of four girls achieving their dreams, working hard, being passionate about music, about art, and performing on stage, dazzling their fans — so it gives their fans this hope that if we work hard, we do succeed." Both Ferlyn's and Tasha's mothers also remain hopeful and confident in their daughters' resilience, and have the best hopes for their success in their endeavour — they're currently tied to a seven-year contract with their managing company, Alpha Entertainment. Said Wang, "She's become a very independent girl, learning how to cook, clean up after and take care of herself... I'm proud of and happy for her; I think they can do it, I do see promise in them." "I'm very proud of (Ferlyn), and I hope that she can perform better and better... I hope for the best for them," adds Wong. Singaporean-Korean girl group SKarf teases with "Oh! Dance"